Today it’s all about Otis. His sister is such a whirlwind that quite often she takes over, commands attention, leaving poor old Mr Fox (called so as Fox is his middle name) to wonder what might have been, but happily get on with playing with whichever toy he has managed to steal from his older sister or climb on whichever piece of furniture is in his path. Trousers: Gap straight cords, bought last year in sale, nearest ones available here. I bought this jumper a couple of weeks back – I love anything French, and the colour really suits Otis. The cords are comfy and practical (and thankfully have plenty of growing room for the winter!) and the shoes are his second pair of ‘big’ shoes – slightly higher on the ankle than just shoes so should be a bit cosier and protective over the winter. 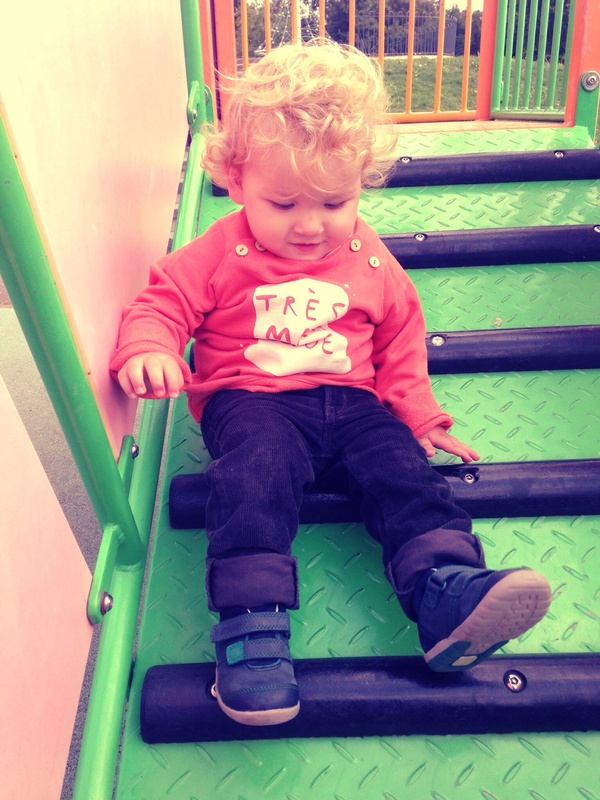 I think the climbing frame at our park is slowly becoming this family’s catwalk…. ← give a kid the right pair of shoes…. part 3!